Flower essences are subtle, energetic medicine that can have a deep effect on wellbeing. They work to realign and balance emotional and spiritual energy bodies by supporting our natural healing process. They gently help us become aware of and shed old patterns and buried emotions that no longer serve us. The flowers help us learn how to approach things in a new way once the old patterns shift. Changes in the more subtle realms of the mental, emotional and spiritual can then trickle out and affect our physical well being. They are very supportive when working with emotional and spiritual pain, as well as the pain from unresolved trauma. 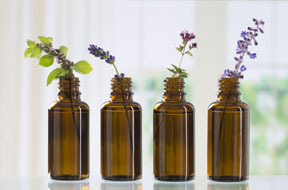 Flower essences are sometimes confused with essential oils. They are actually very different- essential oils are concentrated oil made by distilling plant material, whereas flower essences are very dilute, unscented and contain only the energetic imprint of the flower. They are made by allowing flowers to sit in a bowl of water in the sun (or moon and stars), which then imprints the flower’s energy signature on the water. Flower essences are extremely gentle and very safe to use with anyone including children and animals. When given in combination with acupuncture, bodywork and other forms of healing work they facilitate going deeper and assist with integration. They help calm, harmonize and realign us with our inner nature, allowing us to fully express our authentic selves.